The Art Society at Harvard Business School is striving to bring MBA students into greater contact with the arts at a finance-focused institution. Organizing a variety of events, curating public art on the Allston campus, and making treks to local and out-of-state cultural institutions, the Art Society looks to increase the vibrancy of the arts at HBS. Co-presidents Beth Peters and Dorita Gilinski spoke with The Crimson about the events that the Art Society puts together. The society has run several outings to local museums, such as tours of the Harvard Art Museums and the Museum of Fine Arts, in addition to treks farther afield. “Some flagship events that we have include two treks to New York, one per semester. And they’re basically a weekend where we take a group of about 20 people to go to different museums, meet with art industry figures, go on tours of different artists studios,” said Peters. Gilinski discussed a Miami trek, a December visit to Art Basel, which is one of the world’s largest art fairs. “You have some of the best galleries opening up, and you have lectures, and you have talks, and you also have parties. So we take a group of students together down there, and it’s kind of real exposure to the actual art world, and the actual art market,” said Gilinski. Current club member Mette S. Andersen talked about her experience with the New York trek. “We were shown around Sotheby’s before opening hours … Later we had an hourlong chat with a famous art collector about his passions and how he started, and watched amazing performances by very talented students in a private performance. The great appreciation of all art forms in the people that we have met has been truly inspiring,” she wrote in an email. Peters also discussed events at which students actually get involved with art making itself. “We’ve had some paint night events. We had a workshop at the Harvard Art Museums recently where people went and saw some of Matisse’s cutouts and then went and actually created them themselves,” said Peters. The Art Society actually has another Matisse-related event coming up: they plan to make a trip to the recently opened exhibition of the artist’s work at the MFA. “Right now I’m trying to organize a tour with the curator of the exhibition for HBS students, but even if you’re not an HBS student, definitely go see it. There are some of the best Matisse works ever in there,” said Gilinski. However, some of the most essential work the Art Society does is right on the business school campus: the curation of the Schwartz collection. Endowed by Canadian hedge fund manager Gerry Schwartz, the collection is the body of artworks displayed on the walls of the Business School. “As part of the Art Society we collaborate with the Schwartz collection on a piece to add to the collection every year,” said Peters. 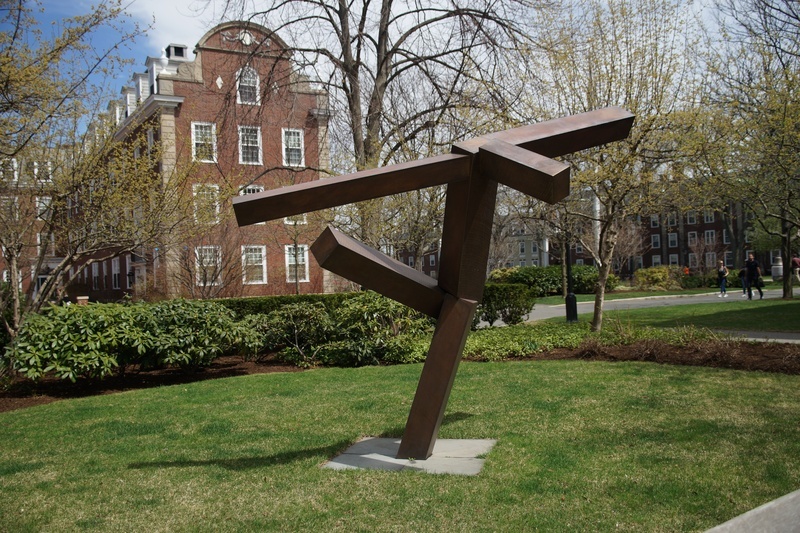 The sculpture program acquires year-long loans of sculptures, which are featured on the lawn. Currently on view is a work by Spanish artist Jaume Plensa. “We get incredible artists, and we work with the administration to get pieces that are kind of representative of the student body,” said Gilinski. In the future, the group is looking for more ways to show the society’s passion for promoting local arts. “One of the things we are thinking about doing for next year is an affordable art fair at the beginning of the year when students arrive, and they are moving into their dorms or their apartments,” said Gilinski. “Putting together a show of young artists who would otherwise not have their art easily sold, so in a way using … a vehicle for that and as a platform for artists, so it works kind of symbiotically.” The Art Society ventures to bring local artists and art appreciation to a space where it might not otherwise receive such focused institutional attention.